When it comes to weight or strength training, which one you think will be more effective? B. Doing 1 set each time 3 times a week (every alternate day)? The answer- you will benefit more from 2 sets (or better still 3 sets) each time twice a week than one set every alternate day. For instance, if you do lat pull like the picture on the right , it will be more effective to do 2 or 3 sets of the exercise at each time. 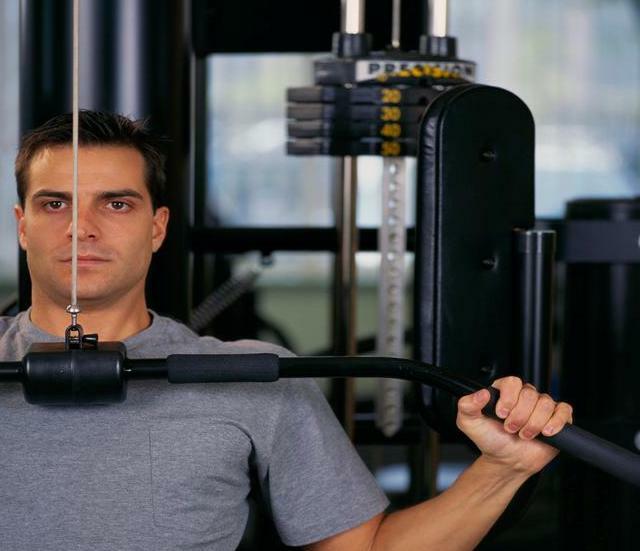 Intensity for your weight training: Select the weight that makes you tire out (means cannot lift anymore) within 8 to 12 times– you will know after a few times of testing the weight. That will be one set. Then rest for about 2 minutes before repeating another set. Ensure your form is proper when you do any weight exercise and do not strain other parts of your body just to pull/life the weight. Else, you run a high risk in overstraining or pulling a muscle- which will be a very uncomfortable experience. Question: Since I am using a few weight machines/free weights, will it be better for me to do one round and come back and repeat the second set? Answer: It would be slightly less effective. The purpose of strength training is to tax the muscle- so that it rebuilts into stronger muscle. Therefore, you should do 2 sets of the same machine consecutively by giving a little rest in between (1 or 2 minutes). And you may be able to lift 40 pounds of weight the first round, but because your muscle tired out, you can only lift 35 pounds- that is okay. A very common mistake I see people doing is that they select weights that are far too light for them. They’ll probably be able to do about 30 continous repetition with that weight. If you do that, you will not achieve the objective that you set out to do- that is to built stronger muscles. An exception would be for those who are extremely unfit, recovering from injury or experiencing pain during exercise (due to conditions such as arthritis)- for these groups- it is always to start with lighter weights but higher repetitions to help restore muscle function. Verified studies have shown that in order to built stronger (not bulkier- just stronger and for women, you get a more toned look- you will not bulk up) muscle, you need to select the weight that tires you out when within 8 to 12 continous repetitions. That means, you probably cannot lift anymore on the 11th or the 13th time. But what I see is that people doing quick repetitions of light weight- like 20 or 30 times- which is no different that cardio machines with a slightly high effort level. If you do that, you will not see a leaner or toner look- neither will you be able to built stronger muscles. With proper weight training, your muscles get stronger. When they are stronger, your cardio sessions improves- you can exercise longer at higher intensities– so the net effect, you burn off more calories compared to if you do not weight train. Your heart and lungs get stronger- your circulation improves due to your improved stamina when you do cardio- and you become much more healthier and do not feel tired. Also, once you activate your muscles (since you weight train them so much), your metabolic rate goes up- even though you are sleeping or not at the gym. And a lot of things that you used to find it to be an effort- such as chasing your kids to feed them, going up a flight of stairs, carrying groceries, hiking becomes so much easier. You will see lots of improvement in your life. There are lots of benefits that comes from weight training. There are some misconceptions surrounding weight training- and some people feel disheartened when they do not see results- because they do not know the correct combination of intensity with frequency.